In the past I’ve written about how coasters have adopted an automobile theme to their trains. Coasters such as the Cop Car Chase operated from 1996 to 2006 at Germany’s Movie Park with trains themed as police vehicles. Zamperla’s Zig-Zag Wild Mouse coaster operates with auto-themed vehicles since 2013 as Twist ‘n Shout at Family Kingdom in Myrtle Beach. the Rock ‘n Roller Coaster limousine themed coaster launches at Disney’s Hollywood Studios, while the Italian Job coasters with cars themed as Mini Coopers at three Paramount parks including Kings Island, Kings Dominion, and Canada’s Wonderland. Carowinds and Kings Dominion boast versions of Intimidator, mega NASCAR themed coasters, and the race car themed Formula Rossa roars at Ferrari World Abu Dhabi. These all make sense. Coasters go fast, just as the automobiles they are themed for go fast. But I did a double-take when I saw the theming recently on Loco Loco at Dixie Landin’ in Baton Rouge, Louisiana. An E & F Miler family coaster, as you can see in the photo, was themed as a farm tractor. Farm tractors don’t go fast. Farm tractors crawl. I can walk faster than farm tractors go. I rode it, of course, and it travels much faster than a farm tractor. It may be the world’s fastest tractor. But I was puzzled by the theming. Liz Haynes Harrison, daughter of owner Sam Haynes, Jr., explained that Dixie Landin’ is Loco Loco’s second home. It first appeared as the Harvest Express Coaster in 2006 at Nut Tree Park in Vacaville, California. Located in the farming country northeast of San Francisco, Nut Tree Park celebrates agriculture, hence the farm tractor theme. The ride was moved to Dixie Landin’ in 2010, where it has thrilled local residents who don’t grow nut trees, but cotton, corn, and sugar cane. Dixie Landin’ was built in 1999 alongside Blue Bayou, it’s sister waterpark, that opened 10 years earlier. Some of its rides came from the now defunct Fun Fair Park. It currently has 29 attractions, including an S&S combo drop tower, a log flume, four roller coasters, a variety of flat rides, 10 games, and much more. One of their coasters, Gilbeaux’s Galaxi, is the smoothest and quietest Galaxi I’ve ever experienced. Built in 1971 by SDC, the ride sits on a perfectly level concrete slab. Each bent leg sits on a block of wood with a ¾ inch (19 mm) hard rubber cushion between the leg and the wood. Nice. But what fascinated me was its collection of classic rides. Whalom Park in Lunenberg, Massachusetts, had a similar collection before it turned out the lights in 2000. Dixie Landin’ still operates a Chance Rides’ Old 99 train ride. I know of no others in service. It has a fleet of 1985 Lusse bumper cars. 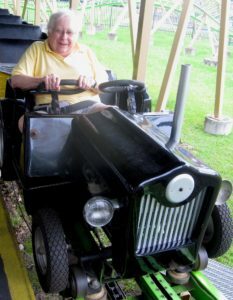 Only four other parks still feature the durable Lusse cars, including Knoebels, Dutch Wonderland, Oaks Park, and Nova Scotia’s Atlantic Playland. There’s a Theel Merry-Go-Round, Hrubetz Paratrooper, Herschell Red Baron, Eyerly Spider, S.A. Roller Works Zoom, and three Hampton kiddie rides. Most of these are over 50 years old, and they purr like new. These are the rides I grew up with, and seeing them again brought a smile to my face.